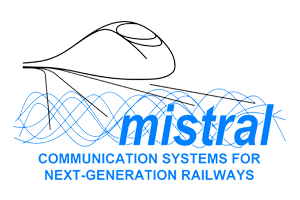 The overall objective of the MISTRAL project is to elaborate on the Technical Specification of the future communication system for all railways in light of the migration from the current obsolete GSM-R. The new radio system will leverage the broadband capacity of IP-based wireless communication to enhance signalling but also to make possible innovative services for both users and train automation/control. To achieve the objective, MISTRAL will generate firstly a portfolio of foreseeable future communication scenarios. Following this, a Techno-Economic Proposition consistent with future scenarios will be defined, including a portfolio of innovative services ushered-in by new technologies and compliant with new users’ requirements as well as with safety, security and quality of service requirements. Such Techno-Economic proposition will be subject to a Business Viability Analysis – meant to gauge and optimize the total-cost-of-ownership of the new communication system – and to a Technical Viability Analysis that will investigate the compliance with the new requirements. Subsequently, the results of such Business and Technical Viability Analysis will be used as basis to refine and finalize the Validated Techno-Economic proposition, which will thus rely on an optimized life-cycle cost and on a sound portfolio of innovative services. The Validated Techno-Economic proposition will be the main output of MISTRAL, i.e. the ‘Technical Specification’ scope of the topic.